Mercedes's new E class will offer automated driving options that are more advanced than those in the flagship S class. The current E class is shown. MUNICH (Bloomberg) -- Drivers of Mercedes-Benz's next-generation E class will have to get used to a startling feeling: the steering wheel moving in their hands as it pilots highways and country roads by itself. "Innovations in this area are coming thick and fast," Thomas Weber, Daimler's head of development, said in his office in Sindelfingen, near Stuttgart. "While we don't want to feed wrong expectations such as sleeping in the car, autonomous driving is set to become a reality much more quickly than the public thinks." Self-driving systems are among many areas in which Mercedes is working to gain an edge on rivals Audi and BMW. Currently No. 3 in luxury-car sales, Daimler's Mercedes brand is fighting to take the lead in the segment by 2020. It's also testing the limits of what's allowed under current regulations, which in most places require the driver to be in a position to control the vehicle at all times. 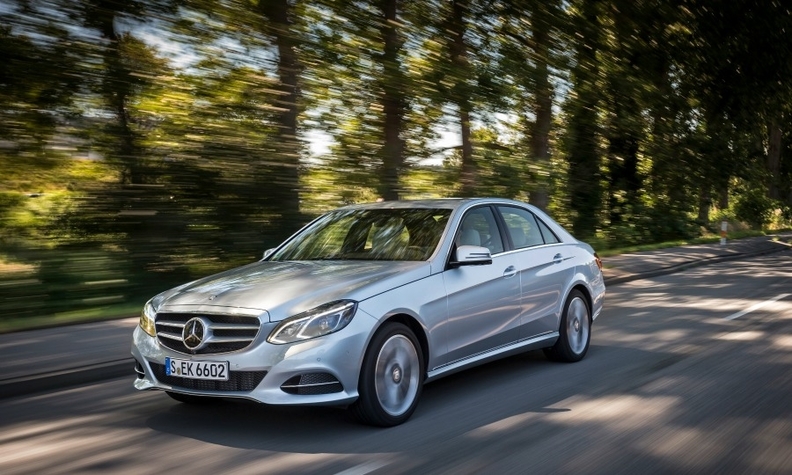 The E class, which competes with the BMW 5 series, Audi A6 and Lexus GS, is Mercedes' mainstay luxury sedan. Offering options more advanced than those in the flagship S class shows how much Daimler is raising the stakes in the battle to reclaim the top spot in premium car sales. Audi has already sent an unmanned RS7 around a track at racing speeds. On a drive last week on highways and country roads in southern Germany near where the E class is built, the car's sensors and cameras smoothly kept it in the middle of the lane. It navigated around generous bends in the road and automatically adjusted the speed according to street signs. While tree shadows and temporary signs at big construction sites sometimes confused the system, it managed dark tunnels and operated to a top speed of 130kph (80 mph). Though nerve-racking at first, the effect was eventually relaxing and comforting. Sharper turns, while technically possible, aren't part of its repertoire yet, Weber said. If the car detects that the driver doesn't have his hands on the steering wheel, the steering aid system first switches on a warning light, then beeps, then turns itself off, forcing the driver to retake the wheel. The experience is interactive enough to prevent the driver from zoning out. Technology like this is moving faster than the laws of the road can keep up, said Wolfgang Bernhart, an automotive expert at Roland Berger Strategy Consultants. The legal framework will eventually have to allow customers to let go of the wheel to check emails or read the newspaper, he said. "If that's not the case, these features will be a hard sell," Bernhart said. The top-of-the-line S class already on the market isn't quite as smart as Daimler says the new E class will be. Still, it can take over in stop-and-go traffic as fast as 60kph and prevent a lane change when another vehicle is in its blind spot. The options are popular: More than 90 percent of S-class buyers in Germany add the 2,250 euro package, Daimler said. In addition to making highway driving simpler, the new E-class's automated systems are designed to help prevent crashes. In a simulation of a sudden highway traffic jam at Daimler's test site, the car screeched to a halt inches away from a dummy after hurtling toward it at 90kph. Several automotive generations into the future, the steering wheel might become optional. Daimler's F015 luxury concept car, shown at the Detroit auto show in January, had swivel seats so driver and passengers could face each other for a chat. How quickly this vision becomes reality depends on how quickly carmakers, legislators and insurers can find legal answers to the question of who's responsible in a crash and solve the moral riddle of how to tell a car what to hit in an unavoidable collision.